According to designer Wayne Cheng, who spoke about the game in an App Store feature, players will see Westmarch during its golden age and roam through new locations like the Shassar Sea in eastern Kehjistan. Nine outdoor zones will be available at launch, according to Blizzard. Six classes will be available to play at launch: Barbarian, Wizard, Demon Hunter, Monk, Crusader, and Necromancer, all with a combination of fresh and familiar skills and abilities. 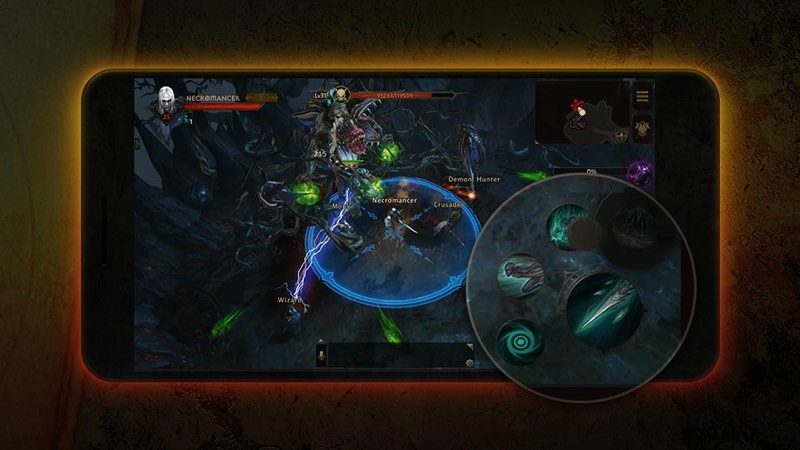 Immortal will expand Diablo's gameplay into a massive, shared online world. Players can play solo or alongside others, with a public hub available for teaming up for raids, upgrading gear, and crafting items. "We'll have dungeon instances - similar to World of Warcraft - that allow you to form groups of four to take on much more difficult challenges," Cheng said. There's no word on PvP gameplay yet, but Blizzard is interested in including such systems to foster a sense of competition and danger from other players. According to Blizzard, Diablo Immortal is being built from the ground up as a mobile experience, and it will "feel familiar and intuitive" to mobile gamers and those who have previously played Diablo on console. Blizzard plans to continually add new content to Immortal, evolving the game over time. The company says players can expect a "steady influx" of new story lines, character classes, challenges, and loot. There is no word on when Diablo Immortal is going to launch, with Blizzard planning to provide more details "in the coming months." Players can pre-register for the game using the Diablo Immortal website. Blizzard today also announced that it is working on a remastered version of Warcraft III that will come to Mac and Windows. Blizzard also debuted a new Hearthstone expansion pack and new Overwatch heroes. You're almost out of health! Would you like to refill your health orb for $.99? If it's not a one time purchase I won't bother. AKA, another time-wasting money grab wearing the skin of an actual popular game. If they'd only make one just like Diablo 2 just new character types or something. The gameplay was great, or at least I thought so. I played that game for so many years! Please don't let this be freemium. Wooooooow this is huge! =))) I was kinda hoping they reboot Diablo II for mobile! But I'd take this too! So many haters whining about IAP, even though nothing in the article mentioned IAP. Frankly, the game play looks great. When Apple released the new iPad a few days ago, some critics talked about how comparisons in power between it and consoles didn't matter, since there weren't console-class games for the iPad... but this looks to have the potential to be one. Mark me as very excited about what this could mean about the future of mobile gaming! It's sad to see people supporting this blatant mobile cash grab garbage. Blizzard/Activision have turned a beloved franchise into a former shadow of itself. The crowd response during the Blizzcon announcement was nonexistent, and there was even one guy who asked the panel if it was an April Fool's Joke (and his question got a bigger rise out of the crowd than the announcement did). For those that don't know, the game is being co-developed with Netease, a Chinese company notorious for putting microtransactions into games. So that's your first red flag right there. The announcement trailer has a current upvote/downvote count of 3.8K to 98K. So obviously a few people aren't happy with this. Just read the massive amount of comments on why this is a slap in the face from Blizzard. Anyone who supports this garbage should be ashamed of themselves. I am a long time Diablo fan, growing up on D1 in high school and playing all of the subsequent games and expansions. They lost their way with Diablo 3 (thanks Jay Wilson), and this is even further signaling that it seems like they just want to kill off the franchise (but make some bucks out of it in the process). This game is NOT Diablo. It is a cash grab from Blizzard when they could have been focusing their efforts on either D4 or at the very least a remake of D1/D2, like most people had expected them to be doing. Because it’s Blizzard, I’m almost certain they won’t mess this up with in app purchases and such non sense. It's a reskin of a Chinese mobile game.